The figure on the side shows the public versus private funding of R&D (GERD funded by government and by industry, as % of GDP), 2005. R&D efforts are largely financed by the business enterprise sector in Europe, the US and Japan. However, the role of government in the financing of R&D should not be underestimated. The level of government-funded R&D intensity is substantial in many high R&D intensive countries (e.g. Nordic countries, Germany, France, Austria and the US), showing that high private involvement in the funding of R&D does not preclude government funding. 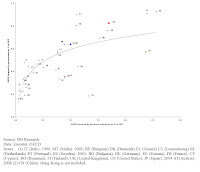 Moreover, in low R&D intensive countries, government-funded R&D is higher than business funded R&D. Government funding of R&D is critical for creating and developing S&T capabilities -a prerequisite for catching-up with countries at the technology frontier, or for supporting research projects with high expected social benefits (see Figure 3.8). In the EU-25, government funding of R&D has been very stable since the end of the 1990s at around 0.64% of GDP (last year available: 2005). In the US, government-funded R&D shows more variability: it decreased from 0.8 to 0.7% of GDP between 1998 and 2001 and rose again from 0.71% of GDP in 2001 to 0.83% in 2004.